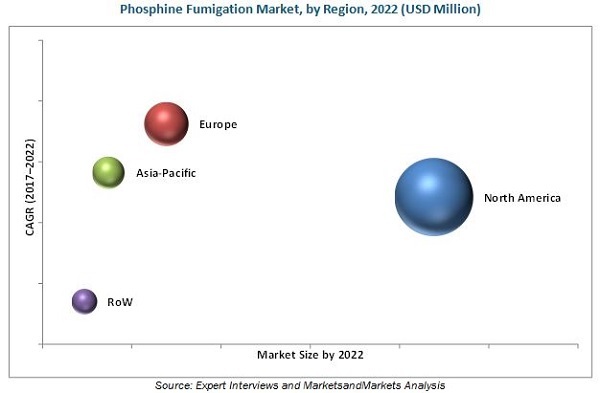 [131 Pages Report] The phosphine fumigation market, in terms of value, is projected to reach around USD 684.19 Million by 2022, at a CAGR of around 5.46% from 2017. This report includes estimation of market sizes for value (USD Million) and volume (KT). Both top-down and bottom-up approaches have been used to estimate and validate the size of the phosphine fumigation market and various other dependent submarkets in the overall market. Key players in the market have been identified through secondary research (The Business Journal and Digital Journal) and their market share in their respective regions have been determined through primary and secondary research. All percentage shares, splits, and breakdowns have been determined using secondary sources and were verified through primary sources. The phosphine fumigation market comprises manufacturers such as Cytec Solvay Group (U.S.), United Phosphorus Ltd. (U.S.), Nufarm Limited (Australia), and Degesch America, Inc. (U.S), which sell phosphine products to end users to cater to their unique business requirements. This research report categorizes the phosphine fumigation market based on type, application, form, and region. The global phosphine fumigation market has grown exponentially in the last few years. The market size is projected to reach USD 684.19 Million by 2022, at a CAGR of around 5.46% from 2017. Factors such as increase in awareness about advanced modes of application of fumigation technology, increasing insect population due to climatic changes, and phasing out of methyl bromide fumigants are expected to drive the market growth. There is high growth potential in developing markets such as Brazil and India, which provides new development opportunities for market players. The phosphine fumigation market, on the basis of type, has been segmented into aluminum phosphide, magnesium phosphide, calcium phosphide, and others. The aluminum phosphide segment is projected to grow at the highest CAGR during the forecast period. It is used as an alternative for methyl bromide fumigant and is comparatively less costly than methyl bromide. The demand for aluminum phosphide is projected to increase owing to the rapidly growing agrochemical industry. Furthermore, the increased agriculture production has led to increased warehousing facilities, which has fueled the demand and usage of aluminum phosphide to protect the stored agriculture produce. The phosphine fumigation market, based on application, has been segmented into stored processed food, raw agricultural commodities, warehouse, and others. The warehouse segment accounted for the largest share of the phosphine fumigation market in 2016. Warehouses are generally used to store food grains or processed food which is highly susceptible to insect infestations and this is one of the main reasons for the usage of phosphine fumigants which has led to warehouse segments being one of the fastest growing segment in the phosphine fumigation industry. The warehouse segment in the phosphine fumigation market is projected to grow at the highest CAGR from 2017 to 2022. The market has been segmented on the basis of form. The solid segment is projected to grow at the highest CAGR from 2017 to 2022. Solid fumigation is carried out by sprinkling tablets, powders, or pellets of measured quantities of fumigants. Solid fumigants are easy to use, safer than gaseous fumigants, and are less harmful to the environment. The European market is projected to grow at the highest CAGR during the forecast period. An outstanding growth is observed in this region for the phosphine fumigation market over the past few years. This growth is attributed to the growth in the production of cereals and grains in the region with advancements in storage technologies in warehouses and innovations in farming technologies with higher efficiency in terms of application. Imposition of new restrictions on phosphine fumigants and stringent regulatory requirements across regions are the restraining factors for the phosphine fumigants market. The phosphine fumigation market is characterized by moderate competition due to the presence of a number of large- and small-scale firms. The market is dominated by players such as Cytec Solvay Group (U.S.), United Phosphorus Ltd. (U.S.), Nufarm Limited (Australia), and Degesch America, Inc. (U.S). These collectively accounted for the largest portion of the agricultural phosphine fumigation market in 2016. New product launches, acquisitions, and joint ventures are the key strategies adopted by players to ensure their growth in this market. Other players, such as Adama Agricultural Solutions Ltd. (Israel), Excel Crop Care Limited (India), Agrosynth chemicals limited (India), Royal agro organic Pvt. Ltd. (India), Nippon chemical industrial Co. Ltd. (Japan), and National Fumigant (South Africa) also have a strong presence in this market. 11.2 ADAMA Agricultural Solutions Ltd.
11.8 Royal Agro Organic Pvt. Ltd.
11.10 National Fumigants (Pty) Ltd.
*Details on Business Overview, Products Offered, Business Strategy, Recent Developments Might Not Be Captured in Case of Unlisted Companies.